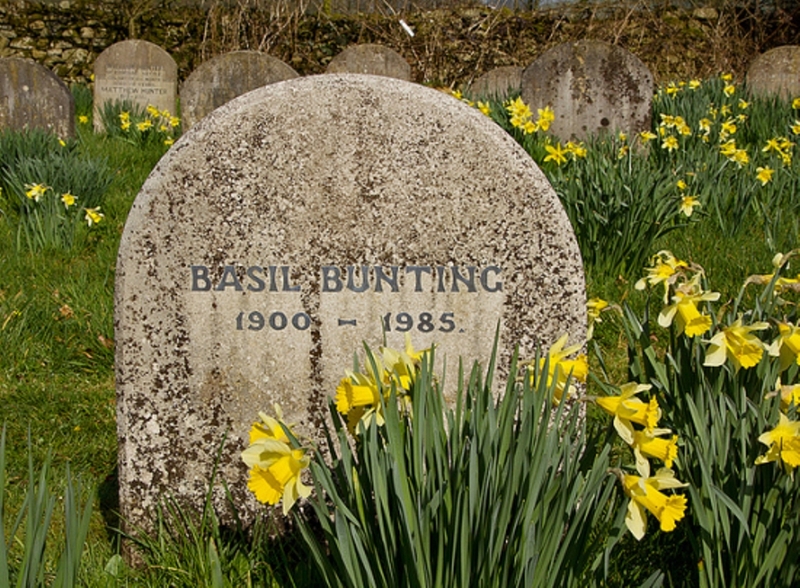 John Halliday discusses the poet Basil Bunting, and introduces the competition in his name. Basil Bunting was a man of his time: having been born in 1900 his age tracked the twentieth century. He is remembered now mainly as a poet who was influential in the emergence of Modernism, and for his famous long autobiographical poem Briggflatts, which would cement his reputation and which was described by the critic Cyril Connolly as “the finest long poem to have been published in England since T.S. Eliot’s Four Quartets”. As well as being a poet for most of his life – he began writing at school, and completed Briggflatts when he was 65 – Bunting also led an extraordinary personal life. He believed that “a man’s circumstances seldom matter to those who enjoy what he makes”, but there have been books written about his personal exploits. His literary life led him to meet, and in some cases befriend, many of the leading poets and writers of the 1900s: Ezra Pound, Ford Madox Ford, TS Eliot, WB Yeats, Ernest Hemingway and Louis Zukofsky. He wrote a couple of poems whilst at school which have survived, but his first real success came with his long poem Villon when he was 25. The poem was admired by Pound and Eliot. His first pamphlet, published when he was 30, was humorously entitled Redimiculum Matellarum, which translates as ‘A Necklace of Chamberpots’. His wanderings ended in the early 1950s when he returned to his native north east, and apart from lecture tours he remained there until his death. It was the young aspiring poet Tom Pickard who was responsible for resurrecting Bunting’s career in the 1960s. Briggflatts was published in 1966 to great acclaim, and Bunting eventually received some credit for his lifetime’s work. He and Pickard were also responsible for building the reputation of The Morden Tower in Newcastle, a small room in the old city walls which became a venue for readings and attracted poets from all over the world. Bunting’s poetry is published by Bloodaxe, and Briggflatts is also available from them with a fine CD of him reading in his distinctive Northumbrian voice. The Basil Bunting Poetry Competition now has a Young Persons Award, in which there are two categories: 10-14 years old and 14-18 years old. Sir Andrew Motion, this year’s judge, says he is “looking forward to the freshness and vitality which young writers can bring to their poems”. Free to enter, the deadline of the competition is 30 September 2013. Go to the Basil Bunting Poetry Competition website to enter – good luck! John Halliday was Basil Bunting’s son-in-law, and is now the executor of his estate. John started the Basil Bunting Poetry Competition five years ago, to keep Bunting’s legacy alive.